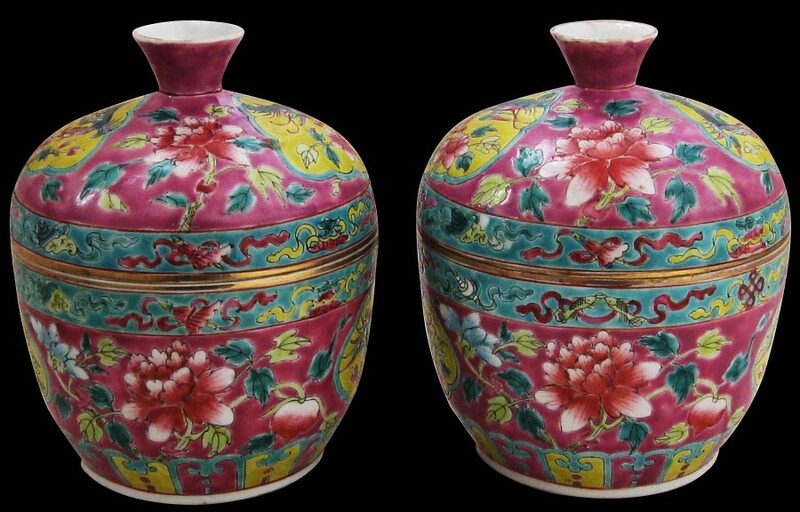 This beautiful pair of kat mau (as these covered vases are known in Singapore, or cepus/chupus as they are known in Malacca, or himchengs as they were called in Penang) have excellent, clear provenance that dates to the 1940s, when they were acquired by an English family in Malacca. 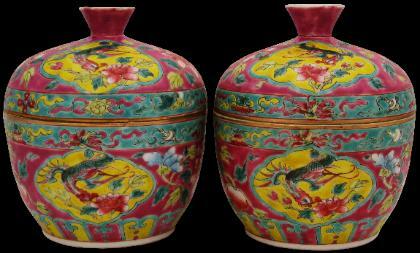 The colour combination of this pair is relatively rare, just as it is rare to find a pair of matching kat mau. The pair are also larger than most extant examples. The bodies and covers are decorated with bright enamels and shaped yellow-ground panels with turquoise borders and decorated with a phoenix in flight over delicately shaded pink peonies, amid a pink background embellished with pink peonies with light and dark green foliage. The top of each base and bottom of each cover has turquoise borders decorated with ribbons and Buddhistic/Taoist symbols. The base of each kat mau has a border of pink and yellow lappets. Each cover is topped with a pale green handle or pull. The edges of this, the cover and the base are finished with gilt. 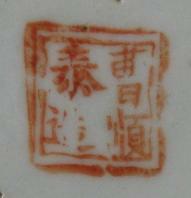 Each kat mau has a red enamel Caoshuntai Zao factory mark to the base. Kat mau vases are always finely potted. 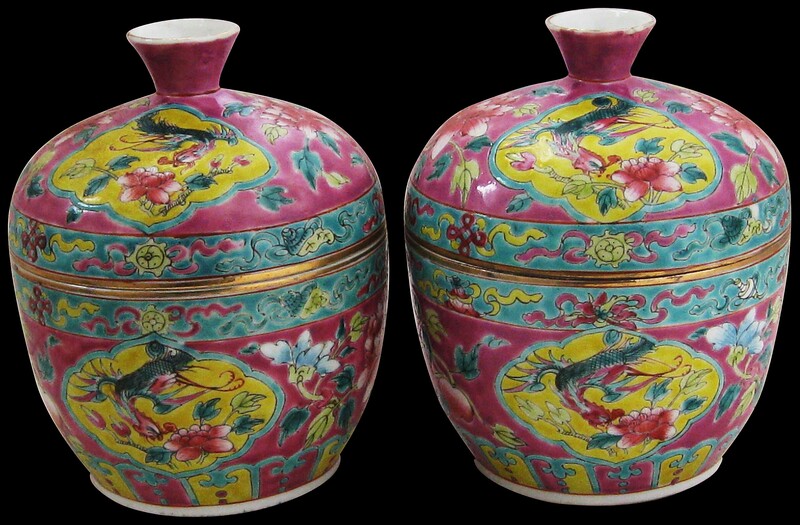 They had no definitive use but usually were part of the large wedding sets that the Straits Chinese commissioned from China. Possibly, they were used to serve bird’s nest soup or glutinous rice balls in syrup – delicacies that by tradition signified marital bliss and prosperity. Kee, M.Y.,Peranakan Porcelain: Vibrant Festive Ware of the Straits Chinese, Tuttle Publishing, 2009; Ho, W.M.,Straits Chinese Porcelain: A Collector’s Guide, Times Books International, 1983.